found on the net someplace..... Should the nest be listed for the purpose? Interesting, I've not seen anything like this before. The Home Depot store in my area has all these angeled plastic pegs things under the roof awning to prevent nest building. I'm not sure what the nest is built upon ... but only now did I see ... that's quite the nice owl ... looks almost like it could be a barn owl ... and those are BIG owls. Watch out for your cats! Then again, considering the snakes and mice I've found inside panels, having an owl nearby might not ba a bad thing. You sure that's an owl, John? That's a barn swallow. Not an owl. Barn swallow is pretty common bird and also there is a small owl called sawheet If I get the spelling right they are very small owl but very instering call sound like hand saw cutting in the wood. The barn swallow is common throughout the world, all over the US, and even here in France. This is one bird you should protect and encourage. They eat only flies, mosquitos and other bugs. The numbers of insects a pair of nesting birds eat and feed their young on is just phenominal- just feeding their young alone takes an estimated 150,000 insects in 3 weeks to fledging. Two broods a year on average, it must get close to half a million bugs per nest per year! A nest takes over a thousand trips to carry each bead of mud for the construction. In a lifetime of migration and hunting a bird may travel over 2 million miles, that's 87 times round the earth! I have a few pairs arrive each year in the woodshed, travel all the way up from Africa to see me! It's a drag remembering to keep the kitchen door shut in summer, as they are prone to pop in for tea, and it's a sod to get them to leave again - just like my mother in law! I just spread a poly sheet under their favorite beam to catch the poo. Don't put up anti-nest devices unless absolutely necessary! We have an old nest in our kitchen, on top of the door bell! 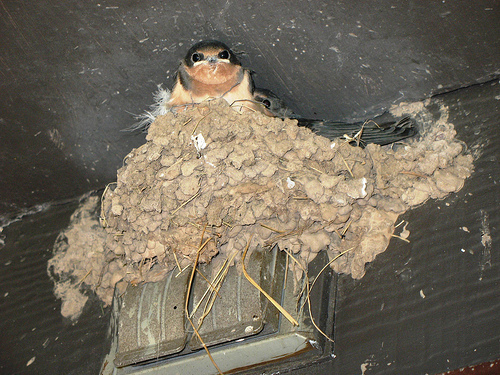 One summer we had to be really careful to keep them from reusing the nest... ever since we kept the door closed. Nothing against them, but not in our kitchen! Besides, it's a holiday home, so we'd have to lock the door going away, killing them - would be extremely cruel. We do allow them to nest in several other places. These guys are really cool flyers too. I love to watch them. When I worked at the airport there was a bunch of them hanging around. One afternoon in the summer, the doors were all open a bunch of about six of these guys came rocketing in the front, made six laps around the hanger and went back out. Few minutes later they were back, six more laps, back out the front. About the same amount of time, they were back, six more laps. This went on for most of the afternoon. I started noticing that each time they showed up, they were in a different formation, delta sometimes, stepped. It looked all the world like they were practicing for an airshow. Yea I know all about how they were finding something for lunch, but to me it sure looked like they were flying for the sheer fun of it.